In my house, we respect Haskins’ ground-game prowess. During the segment, Stephen A. was comparing the two best QB prospects in the NFL Draft — Oklahoma’s Kyler Murray and Ohio State’s Dwayne Haskins. We don’t have to spend much time parsing whether it’s true that Haskins is more of a runner than a thrower, because he is not. He just had the best passing season in Big Ten history. He made dozens of throws 90-plus percent of college QBs could not make in their wildest fantasies. Let’s move along. But Haskins is, in fact, a decent running quarterback. In an effort to immediately extinguish Stephen A.’s bad take, some rushed for the most powerful hose they could think of: Haskins’ career rushing totals. And, wow, those totals aren’t good: 103 carries for 194 yards, or 1.9 per carry, with four touchdowns in two seasons of action (one as the starter). But that’s a misleading line, because the NCAA absurdly insists upon counting sack yardage against QBs’ rushing totals. There’s no good reason for sacks to count against rushes, because by definition, sacks happen on passing plays. When QBs run for negative yards on actual running plays, official scorers count those as rushing yards, because it’s not that hard to tell whether a QB was trying to throw or not. Yet for reasons unbeknownst to me, college football’s governing body thinks bad passing plays should count against rushing stats. Haskins’ real rushing line in 2018: 59 carries for 215 yards (a 3.6-yard average) and four TDs. He took 20 sacks for a loss of 104 yards over the course of the season. So, to some commoner, Haskins’ rushing stats might say 79 carries for 108 yards. I am not here to argue Haskins is a great running QB. But his recorded line for 2018 says he averaged 1.4 yards per carry, which is quite literally in sub-Peyton Manning territory. The NFL’s most famous statue averaged 1.5 yards per rush, without sacks included, over 17 seasons. Tom Brady’s averaged 1.7. Haskins is a more fluid, powerful runner than both. So I’m hopeful that Stephen A. getting Haskins so wrong won’t feed a narrative of him being bad at running, because he’s just fine at it for a big QB whose best value is in throwing. In reality, Haskins will probably be middling as an NFL running QB. The easiest comparison is to a young Ben Roethlisberger, whose 6’5 frame makes him just a little bigger than Haskins at a listed 6’3. When Roethlisberger would run early in his career, it was ugly but, sometimes, undeniably effective. He averaged between 3 and 6 yards per carry in four different seasons from 2006-10, twice going over the 5-yard mark. The average NFL rush for players at all positions hovered just above 4 those years. Running’s been a decent supplement to Roethlisberger’s game even as he’s gotten older and slower. He runs for a touchdown or two most seasons (19 for his career) and has averaged 2.9 yards per run (and about two runs per game) over 15 seasons. Roethlisberger averaged 1.7 rushing yards with sacks included in his last college season. That was Haskins’ third rushing TD of an overtime win at Maryland in 2018, when he had a career-high 63 non-sack rushing yards on 14 carries. 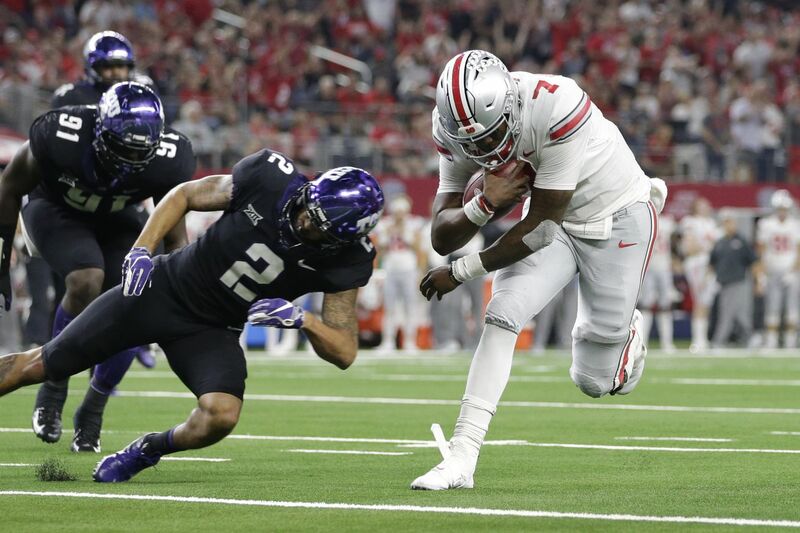 Haskins is a former four-star recruit who makes smart reads and has a good bit of athleticism to him, so expect him to use his legs some in the NFL. Just expect him to throw, I don’t know, 30ish more times per game than he runs, and expect that to be the best idea for everyone.